Caecum (L. caecum = blind) is a large dilated blind sac at the commencement (proximal end) of the large intestine. The position of the caecum is to the right iliac fossa, above the lateral half of the inguinal ligament. Its surface projection takes up the triangular region restricted by the right lateral plane, the transtubercular plane, and the inguinal ligament. Superiorly with the ascending colon. Medially at the ileocaecal junction with ileum, and posteromedially with appendix. Normally the caecum appears as a dilated pendulous sac inferior to the ileocaecal junction. The increase of caecum from beginning results in a change in its shape and in the position of the connection of appendix. At birth, the caecum is conical in shape and the vermiform appendix is connected at its apex. Afterwards the caecal development ends in the formation of 2 saccules, 1 on either side of anterior teniae coli. The development of right saccule is greaterthan the left so the apex of caecum and the base of appendix are shoved toward the left and nearer to the ileocaecal junction. Consequently the base of appendix is connected at the posteromedial wall of the caecum. The caecum and vermiform appendix grow from the caecal bud appearing from the caudal limb of the archaic intestinal loop. The proximal part of the bud dilates to create caecum and the distal part stays narrow and creates the vermiform appendix. On the premise of development of the caecum afterwards on, 4 types of caecum might be seen in adults. Conical type/fetal type (2%): The caecum is conical and the appendix is connected at its apex. Infantile type (3%): The caecum is quadrate in shape (because of identical size of left and right saccules) and the appendix is connected in the depressed underside. Normal type (80-90%): The right saccule is bigger in relation to the left and the appendix is connected on the posteromedial aspect about 2 cm below the ileocaecal junction. Exaggerated type (4-5%): The right saccule is exceptionally large (because of its exaggerated increase) and the left saccule is absent. The appendix is connected just below the ileocaecal junction. Length: 6 cm (2 inches). Width: 7.5 cm (3 inches). Caecum is 1 of those organs of the body which have greater width than length (viz. prostate, pituitary gland, isthmus of thyroid gland, and coeliac trunk). Coils of the small intestine. Anterior abdominal wall (in the right iliac region). Right psoas major and iliacus muscles. 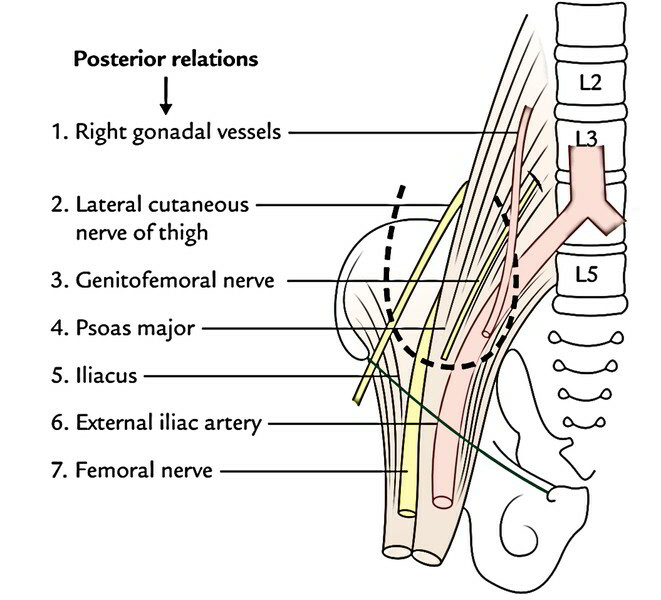 Femoral nerve, lateral cutaneous nerve of the thigh, and genitofemoral nerve of the right side. Right external iliac artery (occasionally). Retrocaecal recess (frequently includes the vermiform appendix). 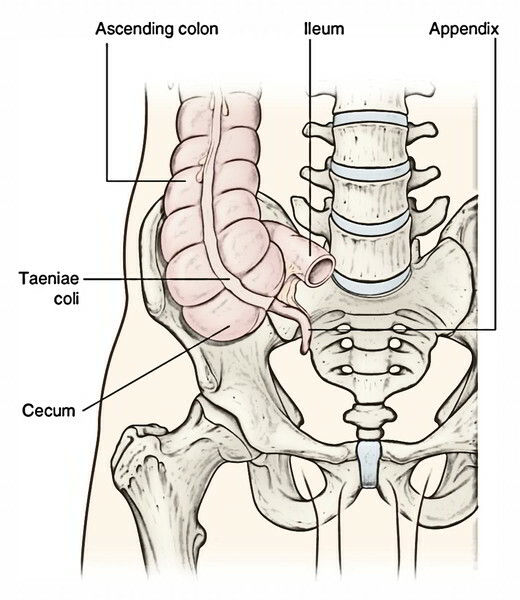 In about 90% people, the caecum is practically entirely encompassed by the peritoneum and has wide retrocaecal recess that might ascend upward posterior to the lower part of the ascending colon and after that named retrocolic recess. The vermiform appendix often is located in the retrocaecal recess. In 10% of people, the upper part of its posterior surface is non-peritoneal and is located directly on fascia iliaca. The other recesses in the ileocaecal region are superior ileocaecal recess underneath the superior ileocaecal fold, and inferior ileocaecal recess underneath the inferior ileocaecal fold. The caecum may have mesentery. It’s mobile in 20% subjects, more frequently in females than in males. It is located between the ileum and the ascending colon. It’s a fold of the peritoneum from the posterior abdominal wall lifted by the anterior caecal artery. Hence, it’s also named vascular fold of caecum. i) It safeguards the superior ileocaecal recess and opens downward and to the left. ii) Inferior ileocaecal fold: It goes from the anteroinferior aspect of the terminal part of the ileum to the caecum or appendix. It will not include any blood vessels, therefore also termed “bloodless fold of Treves”. It is located in front of the ileocaecal recess which appears downward and to the left. It is located on the posterior surface and creates the right boundary of the posterior ileocaecal recess. The Interior of the caecum presents 2 orifices- ileocaecal orifice and appendicular orifice. The ileocaecal orifice is the notable characteristic of the inner part of the caecum. It’s present on the posteromedial aspect of the cecocolic junction where the ileum opens into the large intestine. The orifice measures about 2.5 cm transversely. This orifice is safeguarded by a valve named ileocaecal valve. The valve has 2 lips: upper and lower. The upper lip is smaller and horizontal. It is located at the level of ileocolic junction. The lower lip is longer and concave upwards. It is located at the level of ileocaecal junction. The 2 lips meet in the ends and are continued as the mucous folds termed caecal frenula, which might act ascaecocolic sphincter. Every lip is composed of thickening of circular muscle jacket covered by the submucosa and mucosa. 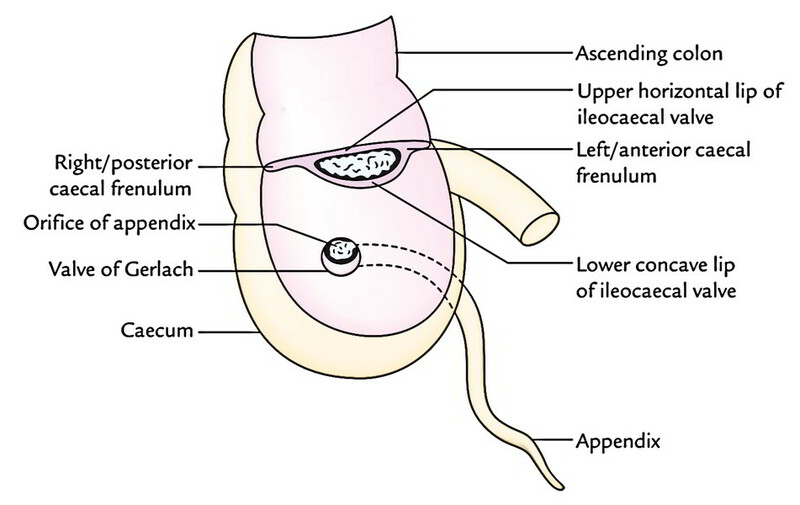 The ileocaecal valve modulates the flow of contents from the ileum to the caecum and prevents regurgitation of contents of the caecum into the ileum. A barium enema that fills the colon entirely constantly enters in the terminal part of the ileum to a varying extent. Failure of easiness of ileocaecal sphincter in longstanding large bowel obstruction can cause distension and rupture of caecum, if the obstruction isn’t relieved. The caecum functions as a guide to surgeon during surgery for intestinal obstruction. The dictum is the fact that if caecum is distended, the obstruction is in the large intestine and if it’s empty the obstruction is in the small intestine. It’s a small circular orifice situated about 2 cm below and somewhat behind the ileocaecal orifice. The orifice is safeguarded by trivial semicircular fold of mucous membrane referred to as valve of Gerlach connected to the lower margin of the opening. The caecum is supplied by the anterior and posterior caecal branches of the ileocolic artery, a branch of superior mesenteric artery. The veins of the caecum follow the arteries and drain into the superior mesenteric vein, which eventually drains into the portal system. The lymph vessels from the caecum drain into the ileocolic lymph nodes, which in turn drain into the superior mesenteric group of pre-aortic lymph nodes. The sympathetic Nerve Supply is originated from T11 and L1 spinal sections via superior mesenteric plexus. The parasympathetic Nerve Supply is originated from both vagus nerves.